B Movies that Copy Pastes Other Movies. The story of the Greek mythological figure, updated in this 80's version. In the post-nuclear wastes of Earth two civilizations fight for survival. The Tyrogs, in the City of Doom, and the Drones, who live underground, free from radiation. The nuclear war is over but the fight for survival has just begun. Sinbad and his shipmates aid a young prince, who must battle an evil wizard to gain the hand of a beautiful princess. 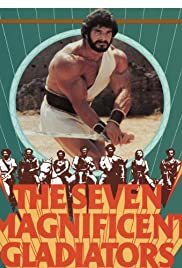 The mighty Lou Ferrigno stars in this swords & sandal take on Akira Kurosawa's classic The Seven Samurai, brought to us in this case by the ever maligned Bruno Mattei. Big Lou's mission, along with his assembled warriors, is to defend a small village from the annual onslaught of a sadistic immortal and his cronies. To aid him in his task, Lou wields a magic sword, a sword in fact that only he can hold and formerly the trusted side arm of none other than Achilles - or so we're told. Cue plenty of fairly enjoyable (if slightly handled) battles as our hero's fight for justice on behalf of the victimised community. OK despite the title this is sadly most definitely NOT magnificent stuff, but it is nonetheless a harmless enough way to pass an hour and a half or so. Besides, how can any man really complain when none other than the gorgeous (and wonderfully buxom!) Sybil Danning is present?! 13 of 13 people found this review helpful. Was this review helpful to you?